Gourmet Partners (M) Sdn Bhd has started introducing the new Chobani Oats range in the Malaysian market. This is the third installment after the cup and the pouch format. 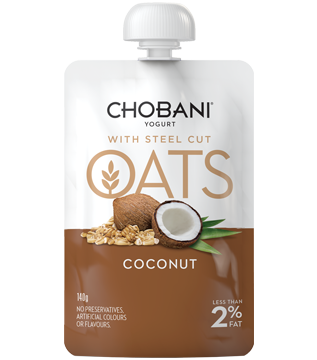 The 140g Coconut Yogurt with Steel-Cut Oats is priced at RM 8.80, which is slightly more expensive than the normal 140g Chobani Coconut Authentic Strained Yogurt selling at Village Grocer for RM 8.10. The Steel-Cut Oats range includes coconut, cranberry and apple cinnamon. No significant launch has been seen in the Greek yogurt category in 2015 apart from a few imported brands that distributors introduce to widen the yogurt selection at premium supermarkets. The last major launch by Nestle was in 2014 when the market was receptive to Greek yogurt. With the absence of audit data, we are guessing Greek yogurt is no longer as exciting as it used to be. Even this blog has not been updating the Greek yogurt scene for quite some time.